Wendy is co-author of the book, The Culture Question. In her work as a mediator, speaker, and facilitator she is committed to helping organizations create dynamic and engaging places of work where people care about each other, are productive, and deliver quality services and products. She has Bachelor’s degrees in both Psychology and Education, and is currently completing a Master’s degree in Conflict Analysis and Management. Wendy is a former teacher and director of a health and social services program. She believes that learning is a dynamic and life-long endeavor and with commitment, guidance, and individualized support, this process should be enjoyable and motivating. In addition to facilitating workshops, Wendy serves as ACHIEVE’s Training and Development Specialist and is the author of many of our workshops including Respectful Workplace, Assertive Communication, and Performance Management. She is an engaging presenter who delivers material in a format that maximizes the learning potential for all participants. Intergenerational relationships have the potential for miscommunication and unproductive interactions. They also hold possibilities for fostering more creative and productive workplaces. 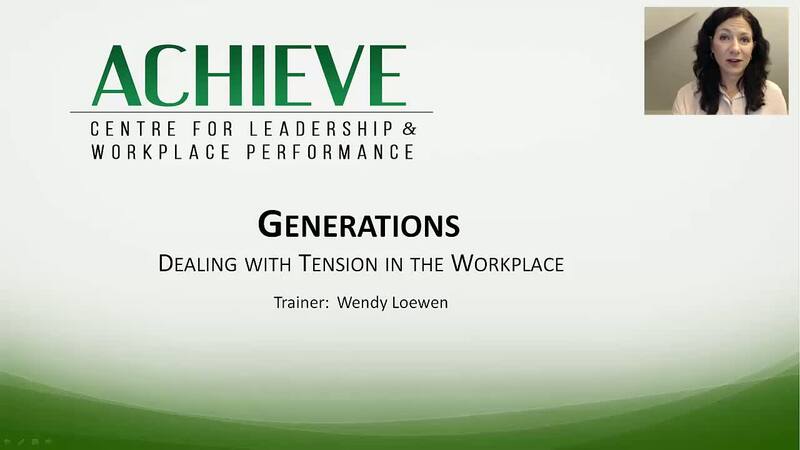 This webinar will help you understand different generational assumptions and consider the gifts that each generation can bring to the workplace. Viewers will explore the prevailing stereotypes about different generations and gain an awareness of their own generational “blind spots” that often lead to misunderstandings and conflict. This webinar reviews practical strategies for intergenerational communication, with a focus on building and maintaining respect in workplace interactions.